Can I just say that I am so happy that puffy vests came back in style? I've had a gray one since high school and I almost gave it away so many times. I am so glad I didn't. They are just the perfect thing to wear when it's chilly but not freezing. Joules has a great selection of quilted vests that are so nice - the quality is incredible. So soft, so warm, and the lining is so pretty! I am so sad the Olympics are over. I was loving the constant inspiration I felt from supporting the U.S. and of course watching sports that I will probably forget about until the next winter Olympics. Also, when did the winter Olympics get so terrifying? I am not sure I ever realized half of the athletes could die if something went wrong (luge, ski jumping, ariel skiing, etc). I'm basically the most cautious person ever, so I was covering my mouth it fear the whole time I watched those events. Did you find any Olympic events terrifying? Thank you all for your sweet comments and emails about the post I published about my skin. Definitely tough to put pictures of yourself with pimples on the internet, but all of your sweet comments and emails made it worth it! I love these vests too and I'm so glad I held onto one of mine from high school. Isn't it weird though that we're already revisiting our high school fashion? 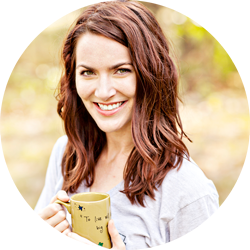 I'm just not sure that I'm ready to bust out the "shortalls" I used to love wearing that I've been seeing in the stores again. I'm so glad puffy vests are in style too, though I'd probably still wear mine even if they weren't =) How fun is that lining! I'm bummed the Olympics are over too. I keep saying, "Are they usually only 2 weeks?!" It felt so short this year! I'm not a big fan of the Olympics, but I absolutely agree with your terror! I saw a few minutes here and there, and even the "safe" sports had me freaking out. I mean - speed skating is just asking for trouble. They are running into each other and knocking each other over with KNIVES on their feet. Same story with doubles figure skating. I was 97% sure someone was going to get sliced and it made me very nervous! I can't imagine doing any of the jumps and tricks from any of the sports. And going downhill at over 70 miles an hour?! Crazy! Love that vest! The inside is so cute! And I've had two of my puffer vests for years. I am so glad I never got rid of them either! I would always get anxious when I was watching figure skating and they would do all their jumps and turns and things- especially if they fell already, I'd always get nervous for their next jumps! All the snowboarding too... yikes. 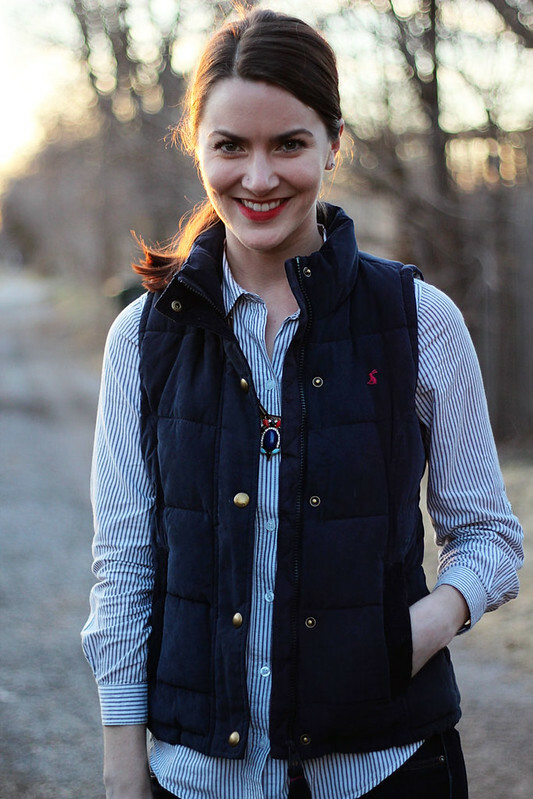 I love, love, LOVE puffy vests. I'd wear them even if they weren't cool. ...and skeleton (a.k.a. head-first luge) terrifies me. There's no way I'm flinging myself into an icy tube at 70+ MPH with just a helmet on. No. Way. Fun seeing you today, pretty girl! Ashley! I love this look so much! Classic, with a twist. You look so pretty! That necklace is so pretty! Love that vest! A navy vest is definitely on my "don't actually need but really, really want" list :) I didn't find much of the Olympics terrifying-- it actually just made me really want to go skiing! 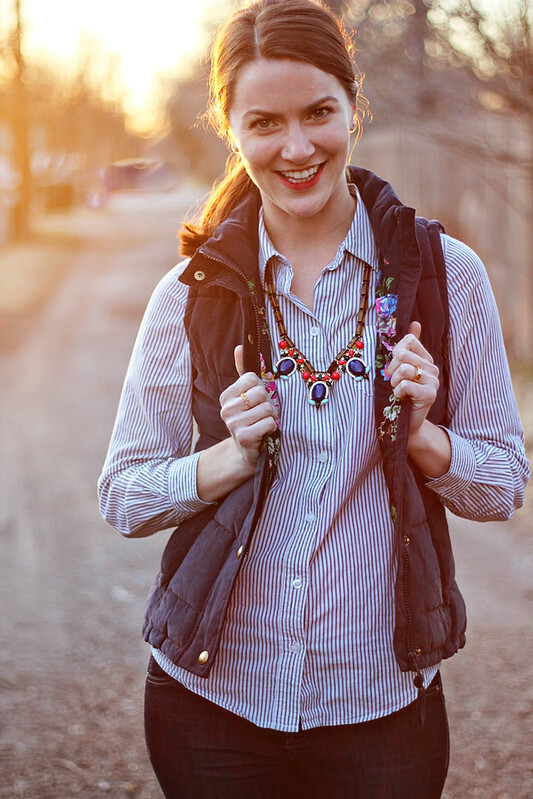 Also, pairing the necklace with the vest was unexpected but such a great addition! 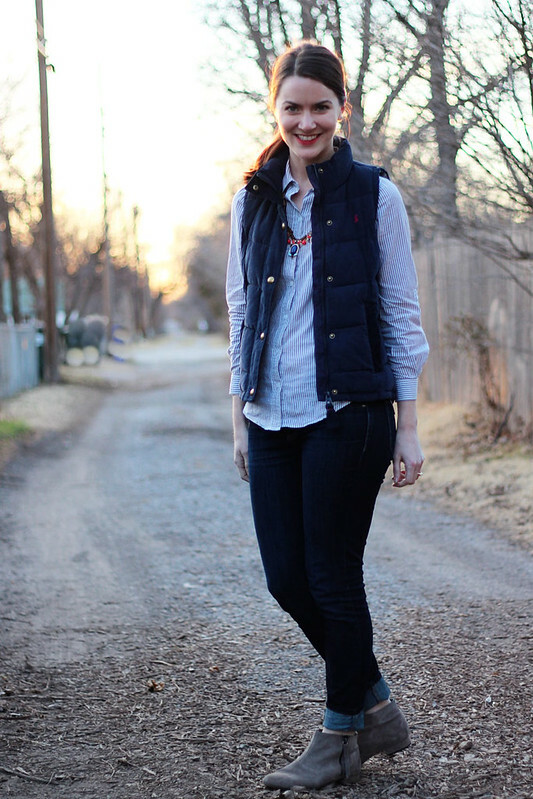 I love puffy vests! They are so cute and comfy!! Love it with the striped shirt. And that necklace is so cute!! love this outfit ashley! so cute!!!! I agree....the winter Olympics are getting so terrifying. And I'm loving your casual chic winter look.....puffers are really cool!!! This is such a chic outfit! Simple yet chic. Puffer vests are perfect to protect one from the chill. The highlight of this outfit, however, is the necklace! Loved your post on skin, I too have had the acne battle for years! I thought your tips were great. I want to try the sulfur soap. And…VESTS! I love vests period. I think I have about 6 or 7 of them. Love how you added a pop with your necklace. what a perfect winter outfit. 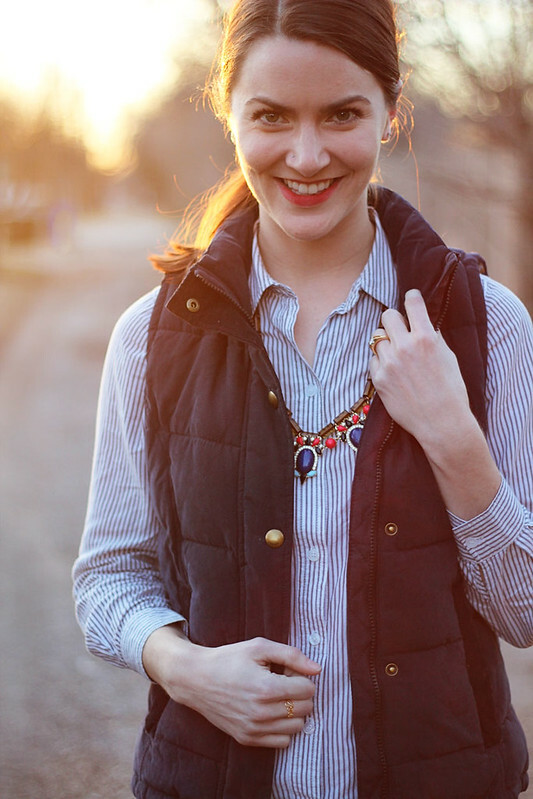 i love pretty much all vests...this one is no exception! cute outfit! and I am with you on the vest. 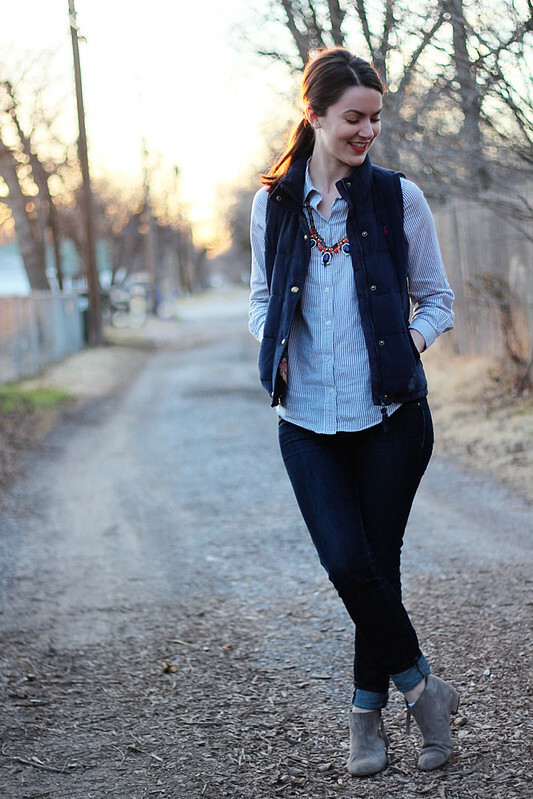 Vests are the best especially in spring and fall. hey pretty lady! I had a bright orange puffer vest when I was in high school and I am still sad I got rid of it, lol. Love this outfit, it's totally something I have worn before - as I'm a big fan of classy casual AND the color blue. I love your tonal outfit, with the different shades of blue. That vest is something special with it's gorgeous lining. I love pieces like that, that have that extra something special. Your cuffed denim and booties is a really cute look. I know cuffed denim has been in for a while now, but I'm just now getting into doing it myself. That necklace is super pretty, too! Oh my gosh, your vest's lining is SO pretty! I know that usually, people don't see linings on things like vests, blazers, the inside of purses, or even the waistband on a pair of pants...but fun/cute linings on some of my pieces make me feel so happy all day. Is that weird? I don't know...hahaha!